Honda first entered the local four-wheeled market with the fourth generation Honda Civic back at the beginning of the 90s. In the following years it established itself as an affordable sporty compact car, this image was further cemented when the iconic high-revving SiR was introduced in the late 90s. While the Civic evolved into a more mature and more practical sedan in the 2000s, Honda has infused the latest iteration of the Honda Civic with some of the sportiness found in earlier models. Honda's all-new tenth generation Honda Civic marks the model's return to being a fun sports sedan. It s now longer, wider and lower than its predecessor. While the past two generations of the Civic embraced the semi-cab forward wedge-like proportions, the all-new Civic adopts a more rearward positioned cabin. This gives the car a longer more prominent hood, while its fastback roofline gives it the classic coupe-like long hood - short trunk proportions associated with coupes and premium sports sedans. Up front it receives the brand s new corporate face which is dominated by a chrome wing grille design flanked by tapered slim full LED headlights. Below it is an aggressive bumper fascia design which features a big lower central intake and side intakes which also house the fog lights. Moving on to its sides, Honda gave it flowing lines and sculpted sides for a more muscular appearance. A crisp character line rises through the doors and gradually slopes down towards the rear end; this accentuates its wide rear haunches. At the rear are C-shaped LED taillights which extend to the tops of the trunk lid, this gives the Honda Civic a distinctive light signature. Inside the sporty theme continues with a nicely laid out driver-oriented dashboard which features a TFT digital instrument cluster and an infotainment system with a seven-inch touch screen. It now gets an electronic parking brake to free up center console space. 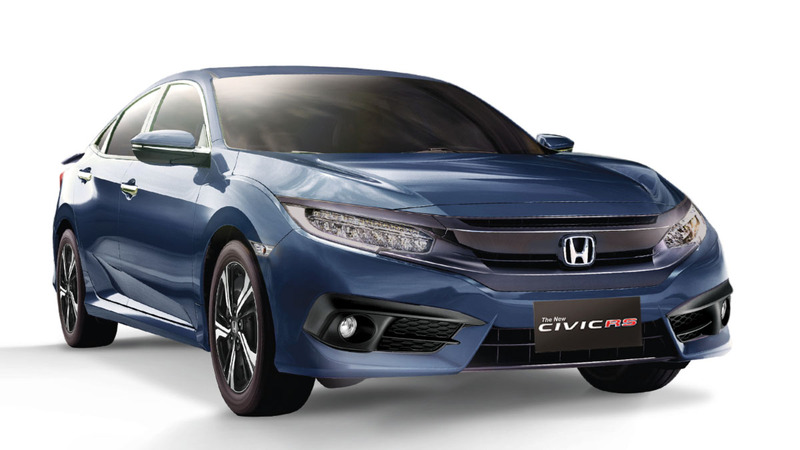 Despite the latest Civic growing in size, Honda has managed to shed some weight, while at the same time stiffening the car s unibody body structure. Handling has always been part of the Honda Civic s DNA, the tenth generation Civic employs MacPherson struts with stabilizers up front and a multi-link set up at the rear, both have been engineered to offer agile handling and improved NVH (noise, vibration and harshness). All variants come with vented disc brakes up front and solid disc brakes at the rear. Like its predecessor, its rack and pinion steering is electrically assisted. Two gasoline engines are offered, the tried and tested naturally aspirated 1.8-liter i-VTEC inline-4 mill which produces 139hp and 174Nm of torque and the all-new 1.5-liter VTEC Turbo inline-4 motor which produces 171hp and an impressive 220Nm of twist at 1,700rpm to 5,500rpm. Both powerplants are mated to a continuously variable transmission; the RS Turbo variant gets paddle shifters. In the safety department, all Civics feature dual-airbags, ABS, and Electronic Stability Control, the RS Turbo gets additional side and curtain airbags. The White Orchid Pearl paint costs an additional P20,000.